"So he laid out a simple picnic lunch. There was nothing but pie. 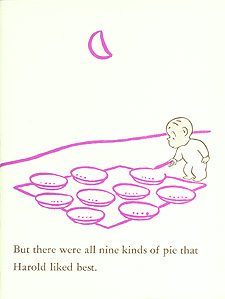 But there were all nine kinds of pie that Harold liked best." With the understanding that any list of favorites is necessarily subjective, I've made a list of "Crockett Johnson's Greatest Hits." Some of these never "hit" commercially, others did; some may strike you as "great," and others not. But, since Johnson wrote and illlustrated 30 books* and illustrated another 7 on top of that, I thought that an attempt to offer recommendations might help any reader new to his work. The lists are divided into two categories, "Essential" (the books that no home should be without) and "Blue Ribbon" (the best books absent from the "Essential" category). Essential, like a purple crayon and the moon. Blue Ribbon: the best not included in the "Essential" list. *Including the six Barnaby books from the 1980s. See the "Books" section of the Bibliography. "And he left his yard, taking his purple crayon and the moon along." These are the essential ones. Just as Harold never goes anywhere without his purple crayon (and the moon), you should not go any further without reading these books. So visit your local library or bookstore! If you're in a purchasing mood, try both new and used bookstores: as I write this, The Carrot Seed and the Harold books are in print (HarperCollins), but Barnaby, Willie's Adventures, and The Emperor's Gifts are not. Barnaby (1943), Barnaby and Mr. O'Malley (1944). Any of the Barnaby books -- whether the two published in the 1940s or the six printed in the 1980s -- deserve your attention. Please note: unlike the rest of the books on this list, these comics may go over the heads of young children. The Carrot Seed (1945) by Ruth Krauss and illustrated by Crockett Johnson. Willie's Adventures (1954) by Margaret Wise Brown and illustrated by Crockett Johnson. Harold and the Purple Crayon (1955). All of the Harold books are great, but I've limited myself to three here. A Picture for Harold's Room (1960). "There were seven pups, and the children said, 'We will put a blue ribbon on the BEST puppy here.'" Like the children trying to decide which puppy is the BEST, I find that I want to award blue ribbons to more than just a few of Crockett Johnson's books. Many of these arguably could be on the "essential" list, but (since I've committed myself to ranking these) I had to draw the line somewhere. So, to paraphrase The Blue Ribbon Puppies, the books below are the best -- the best books not included on the above list. If you're looking for these, you'll want to browse in both new and used bookstores: as of this writing, Who's Upside Down? (republished in 1990 by Linnet Books, an imprint of the Shoe String Press), Ellen's Lion (republished in 2003 by Alfred A. Knopf), and the Harold books (published by HarperCollins) remain in print. Is This You? (1955) by Ruth Krauss and Crockett Johnson. Harold's Trip to the Sky (1957). The Blue Ribbon Puppies (1958). Harold at the North Pole (1958). Ellen's Lion (1959). According to Lee Bennett Hopkins, this book and The Lion's Own Story (1963) were Johnson's personal favorites. Will Spring Be Early? or Will Spring Be Late? (1959). We Wonder What Will Walter Be? When He Grows Up (1964). The rest of these pages are © 1998-2010 by Philip Nel. Read the Disclaimer.